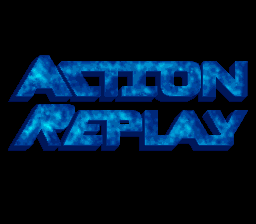 The third and final version of the SNES Action Replay, featuring a spiffy new interface, more ROM-patching support, and lots of built-in codes for a variety of games. 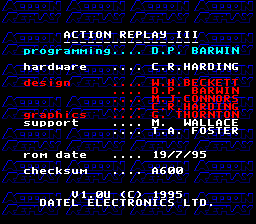 Hold A as the Action Replay logo fades out to display a credits/information screen. This screen contains the program version, copyrights, build date, and checksum. 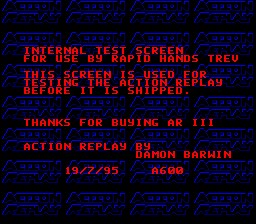 Hold Y+A while booting/restarting the menu to enter a simple test mode. From here, pressing B will strobe the two cartridge LEDs and then start the attached game with the code 7E001902 active. At CPU address 00D48B (right after the text for the credits/info screen) is the string "THIS IS THE START OF THE END", followed by some no-longer-used routines which attempt to poll the values at CPU addresses 00D500 through 00D50F as part of some unknown functionality. This page was last modified on 25 August 2016, at 21:52.